Hartmax ICT Solutions is a friendly IT company providing all sizes of organization with leading-edge technology solutions. We are committed and dedicated to Information Communication Technology, offering innovative and high-tech services to meet the needs of modern day businesses and individuals. Our services includes but not limited to Networking, Web Development, Database management, Application development, Offering world-class consulting and software development. We were formed with the aim of assisting organizations in using modern technology with a close relationship and continual personal interaction between our staff and the client. We understands that every business is unique, and because of this we offer support options that can be personally tailored to suit your IT needs. E-PINMALL is a brand of Hartmax ICT Solutions. 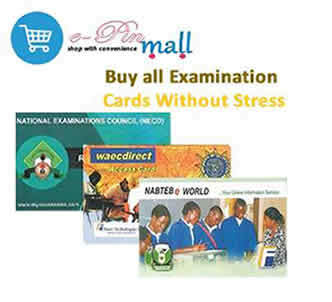 It is our online portal where we render sales of all Nigeria Examination Cards such as WAEC, NECO, NABTEB and JAMB. We take great pride in delivering Correct and Valid PINS at the lowest price offer and provide 100% Product availability with fast online delivery. Through this portal, we also provide Educational support services to prospective students across the Nation. Payments for products are purely online through a well secured interswitch webpay platform. Delivery of value is completely free, instant and automatic.